Hat tip to Richard Florida for making me aware of this book. 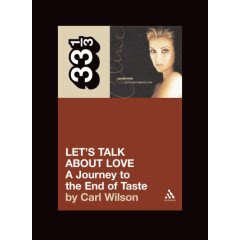 Carl Wilson is the author of Celine Dion's Let's Talk About Love: A Journey to the End of Taste. There are a lot of reasons to read this book. Those who have some experiential knowledge of that Dionysian urban concoction called Las Vegas will especially enjoy Wilson's reading of kitsch artistic expressions and the city itself. The premise of the book is fundamentally a 'reading' of taste. What is it about such performers as Céline Dion that allows them to evoke either extreme dislike or utter adoration? Is it, perhaps, that we need the presence of kitsch as much as the presence of substance? Mostly, I am of the belief that what kind of music we invest in and listen to reflects our very natures. Hence, doing a reading of musical tastes reveals many things of substance about us. Wilson's book is the kind of fast read that forces one to ask lasting questions. And that can never be a bad thing. when looking for substance in the arts, i wouldn't think of vegas. when looking for kitsch, i do. but then again they do have some good galleries there. then again they have siegfried and celine. so, all in all, i guess you do need kitsch, as you seem to point out, to balance substance. The book brings to life the 'pace' of Vegas life and 'art', I though. Kitsch is bound to accompany substance, yes. I am on to the notion that one needs kitsch against which to gauge real substance. Although, I tend to think of what I like to listen is really good and I turn off or block out what I do not like to hear. so, what if I'm into Wagner?